Прорисовка основана на PDB 3E9L. Обрабатывающий сплайсинг пре-мРНК фактор 8 (англ. «Pre-mRNA-processing-splicing factor 8) — белок, который у человека кодируется геном PRPF8. Сплайсинг пре-мРНК проходит две последовательные стадии трансэтерификации. Белок, кодируемый этим геном, является компонентом как U2- так и U12- зависимых сплайсосом, и создаёт что необходимо для катализа стадии II процесса сплайсинга пре-мРНК. Он производит несколько повторов WD, которые функционируют в межбелковых взаимодействиях. Этот белок имеет некоторое сходство с дрожжевым белком Prp8. Этот ген является кандидатом для аутосомно-доминантного пигментного ретинита. PRPF8, как было выявлено, взаимодействует с WDR57 и EFTUD2. ↑ McKie AB, McHale JC, Keen TJ, Tarttelin EE, Goliath R, van Lith-Verhoeven JJ, Greenberg J, Ramesar RS, Hoyng CB, Cremers FP, Mackey DA, Bhattacharya SS, Bird AC, Markham AF, Inglehearn CF (Jul 2001). “Mutations in the pre-mRNA splicing factor gene PRPC8 in autosomal dominant retinitis pigmentosa (RP13)”. Hum Mol Genet. 10 (15): 1555—62. DOI:10.1093/hmg/10.15.1555. PMID 11468273. ↑ Luo HR, Moreau GA, Levin N, Moore MJ (Jul 1999). “The human Prp8 protein is a component of both U2- and U12-dependent spliceosomes”. RNA. 5 (7): 893—908. DOI:10.1017/S1355838299990520. PMC 1369814. PMID 10411133. ↑ Entrez Gene: PRPF8 PRP8 pre-mRNA processing factor 8 homolog (S. cerevisiae) (неопр.). ↑ 1 2 Achsel, T; Ahrens K; Brahms H; Teigelkamp S; Lührmann R (Nov 1998). 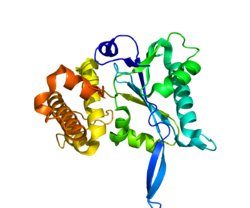 “The Human U5-220kD Protein (hPrp8) Forms a Stable RNA-Free Complex with Several U5-Specific Proteins, Including an RNA Unwindase, a Homologue of Ribosomal Elongation Factor EF-2, and a Novel WD-40 Protein”. Mol. Cell. Biol. UNITED STATES. 18 (11): 6756—66. ISSN 0270-7306. PMC 109259. PMID 9774689. Grainger RJ, Beggs JD (2005). “Prp8 protein: At the heart of the spliceosome”. RNA. 11 (5): 533—57. DOI:10.1261/rna.2220705. PMC 1370742. PMID 15840809. Garcia-Blanco MA, Anderson GJ, Beggs J, Sharp PA (1990). “A mammalian protein of 220 kDa binds pre-mRNAs in the spliceosome: a potential homologue of the yeast PRP8 protein”. Proc. Natl. Acad. Sci. U.S.A. 87 (8): 3082—6. DOI:10.1073/pnas.87.8.3082. PMC 53838. PMID 2139226. Pinto AL, Steitz JA (1989). “The mammalian analogue of the yeast PRP8 splicing protein is present in the U4/5/6 small nuclear ribonucleoprotein particle and the spliceosome”. Proc. Natl. Acad. Sci. U.S.A. 86 (22): 8742—6. DOI:10.1073/pnas.86.22.8742. PMC 298364. PMID 2479028. Bach M, Winkelmann G, Lührmann R (1989). “20S small nuclear ribonucleoprotein U5 shows a surprisingly complex protein composition”. Proc. Natl. Acad. Sci. U.S.A. 86 (16): 6038—42. DOI:10.1073/pnas.86.16.6038. PMC 297770. PMID 2527369. Anderson GJ, Bach M, Lührmann R, Beggs JD (1990). “Conservation between yeast and man of a protein associated with U5 small nuclear ribonucleoprotein”. Nature. 342 (6251): 819—21. DOI:10.1038/342819a0. PMID 2532307. Umen JG, Guthrie C (1996). “Prp16p, Slu7p, and Prp8p interact with the 3' splice site in two distinct stages during the second catalytic step of pre-mRNA splicing”. RNA. 1 (6): 584—97. PMC 1369303. PMID 7489518. Greenberg J, Goliath R, Beighton P, Ramesar R (1994). “A new locus for autosomal dominant retinitis pigmentosa on the short arm of chromosome 17”. Hum. Mol. Genet. 3 (6): 915—8. DOI:10.1093/hmg/3.6.915. PMID 7951236. Reyes JL, Kois P, Konforti BB, Konarska MM (1996). “The canonical GU dinucleotide at the 5' splice site is recognized by p220 of the U5 snRNP within the spliceosome”. RNA. 2 (3): 213—25. PMC 1369364. PMID 8608445. Hinz M, Moore MJ, Bindereif A (1996). “Domain analysis of human U5 RNA. Cap trimethylation, protein binding, and spliceosome assembly”. J. Biol. Chem. 271 (31): 19001—7. DOI:10.1074/jbc.271.31.19001. PMID 8702566. Chiara MD, Palandjian L, Feld Kramer R, Reed R (1997). “Evidence that U5 snRNP recognizes the 3' splice site for catalytic step II in mammals”. EMBO J. 16 (15): 4746—59. DOI:10.1093/emboj/16.15.4746. PMC 1170101. PMID 9303319. Makarov EM, Makarova OV, Achsel T, Lührmann R (2000). “The human homologue of the yeast splicing factor prp6p contains multiple TPR elements and is stably associated with the U5 snRNP via protein-protein interactions”. J. Mol. Biol. 298 (4): 567—75. DOI:10.1006/jmbi.2000.3685. PMID 10788320. Le Hir H, Moore MJ, Maquat LE (2000). “Pre-mRNA splicing alters mRNP composition: evidence for stable association of proteins at exon–exon junctions”. Genes Dev. 14 (9): 1098—108. PMC 316578. PMID 10809668. McHale JC, McKie AB, Tarttelin EE, Inglehearn CF (2000). “Expression map of human chromosome region 17p13.3, spanning the RP13 dominant retinitis pigmentosa locus, the Miller-Dieker lissencephaly syndrome (MDLS) region, and a putative tumour suppressor locus”. Cytogenet. Cell Genet. 88 (3—4): 225—9. DOI:10.1159/000015556. PMID 10828595. Эта страница в последний раз была отредактирована 3 октября 2017 в 18:54.